Suuuuuuuper delayed post. But I really want to finish the series. 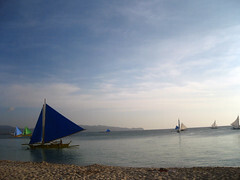 We went to station 3 for our paraw sailboat. I had a hard time getting on the boat!!! Waaah. Kakahiya talaga :( Pero once I got in, we were on our way. Ahoy! On our way back, I had to go to the other side of the boat. Pucha naman, hirap na hirap na nga ako sa pag-akyat, palilipatin pa ako. Hehehe. 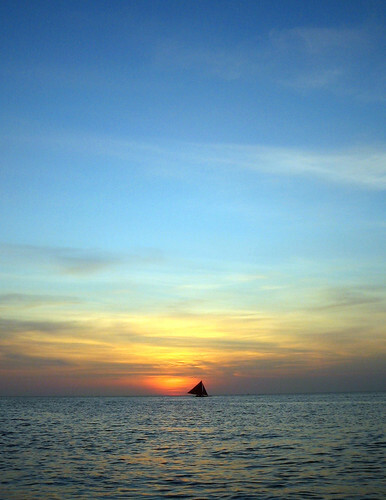 We scheduled our sailing during the late afternoon to catch the sunset while we were in the middle of the sea. 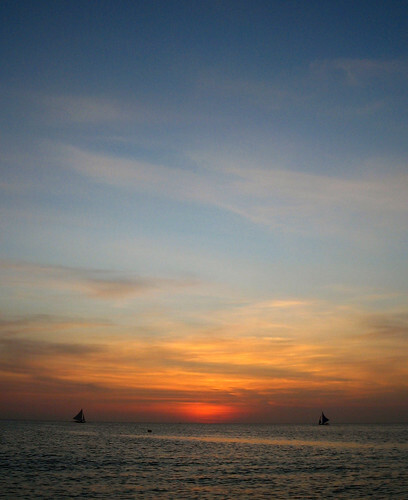 Good thing the Ixus was still up to the task kahit deadbatt na. Our paraw didn't have on-board music, so I had my phone blasting John Mayer's Continuum album during our trip. Bagay mellow music eh, hehehehe. Then it was over, and we were hungry so on our way back, we had some "street" food -- some hotdogs and the infamous chori burger! The next day we just ate a hearty breakfast, bought more pasalubong, then went on our way to Kalibo. Then to Manila, and yes, the flight was delayed, AGAIN. 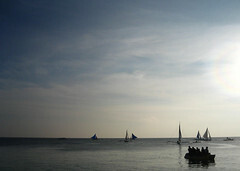 I would definitely go back to Boracay again -- to go snorkeling, island hopping, and to experience it as a "party" place. I knew I wasn't going to do all that, and that was fine with me :) I knew it was going to be mostly shopping and eating, and what I love about Dar is that he doesn't set a budget, so we shopped to our heart's content, and ate as much as we want, too, hehehe. i love those 2 pictures--so serene, so at peace. lino, corny talaga si dar, diba nga teenybopper sya? ehehehe.